We are delighted to launch a new series of Quentin Blake's illustrations of Roald Dahl's immortal stories. 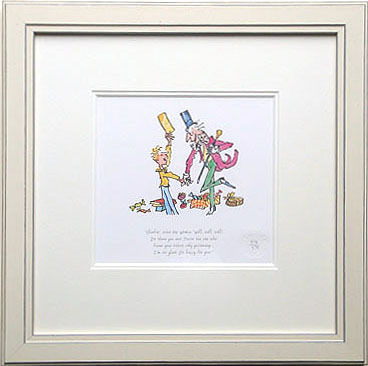 Each edition is approved by Quentin Blake, strictly limited in number, embossed with the official Collector's Edition blind stamp and numbered in pencil. Each print is supplied in a high-quality double-mount, and cellophane-wrapped with its certificate of authenticity. “There is no-one to touch him.” Roald Dahl. The first book Roald Dahl and illustrator Quentin Blake worked upon together was THE ENORMOUS CROCODILE. Roald Dahl and Quentin Blake soon became firm friends, cementing one of the most eye-catching and distinctive collaborations in children’s literature. Roald Dahl died in 1990. His work has been published in over 40 languages and today is considered one of the world's greatest ever children's authors. 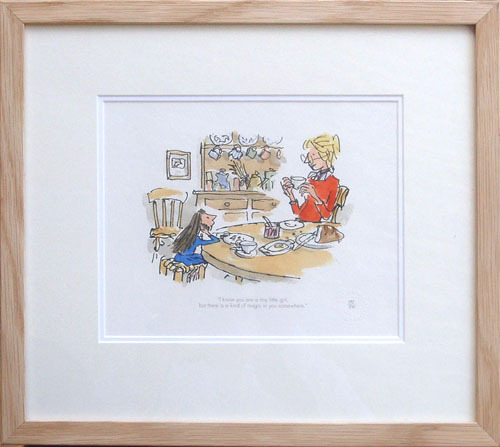 NB Prints are fully approved by Quentin Blake, blindstamped and numbered, but not signed. A certificate of authenticity is included with each. All images in this gallery are Copyright RDNL / QB . Strictly no reproduction without permission. Alternative framing - please email if you prefer the white framed option.